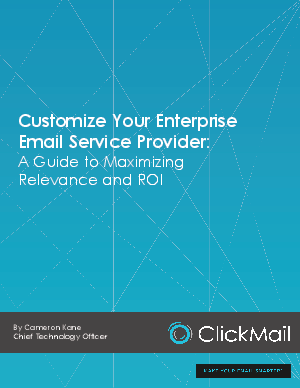 > Research Library > ClickMail Marketing > What are the six most important ESP customizations? Find out how your ESP can be custom tailored to perform at its peak. You’ll learn how customizing your ESP gets you as close as possible to the Holy Grail of emailing the right people the right content at the right time. How the right analytics tool generates insights (and actions) that improve campaigns – fast. We hope you find this Guide informative and thought provoking. Once you’ve read it, we’d be delighted to discuss how customizing your ESP can make your email smarter.